UPDATE: "I've got the proofs in and they look good - though I'm sure I've missed *something* (You always miss something.) I'm having 400 copies of each deck printed and shipped here. Most of you have filled out your surveys, so I've got your information. You've seen the electronic versions. So the next time I update this project, I'll have them in hand and will be getting ready to send them out to you. Thank you again for your support." 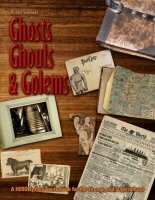 If you're interested, there's a positive review of Michael Surbrook's Ghosts, Ghouls, & Golems (as well as other games) from our friends at Comics, Clerics, & Controllers available HERE. Ron Edwards has been working away on Champions Now, extensively playtesting his vision of Champions with numerous fans. Some sessions and partial sessions of his initial recent play of the first-generation rules with very little alteration can be seen HERE, HERE, and HERE. Be warned that the the recordings are incomplete and very rough, as he was working through different options for the right tech at the time. All the sessions of his extensive game using the Alpha rules (which kept altering as they went along) are HERE, while Robert and Abby Baldwin’s Alpha game with Ron is discussed HERE, and the direct link to their blog describing the game in detail are HERE. Finally, the sessions for Ron's current Beta game are HERE. Many villains are always in the news; many are always on our minds. Some, however, have not been seen for years and to some this means that they are retired, in jail, or dead. Only if this was in fact the truth! Many villains have gone into hiding, while others are simply enjoying the fruits of their “labor.” Some are sitting on a secluded beach getting a tan or perhaps amusing themselves in a casino or nightclub in a friendly country. Still others are upgrading their tech or learning some new ricks to use on heroes and law enforcement. The truth is that all villains aren’t created or driven in the same way. Here you will find villains of old back from their self induced hiatus and ready to pounce on the world again. 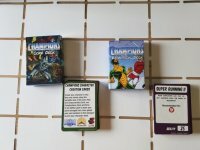 Villains from some of Hero Games older material that have yet to be upgraded to 6th edition. Some of your favorite or perhaps “lightly” used villains, perfect to inject into a new Champions campaign. 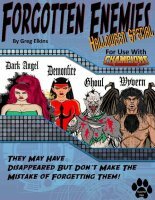 In this installment 6th edition stats for Death Angel, Demonfire, Ghoul, Wyvern will be given including Hero Designer files & printable cardboard miniatures. Welcome to the inaugural installment of Monster Mash! Here you will find new creatures and/or new takes on old creatures for your Fantasy Hero Campaign. This installment will cover a new creature known as the Krylon. Krylons are an insect-like race that have suddenly appeared in the Realm. They are dangerous creatures that come in several different forms. They will kill any creature they can for food: cows, rabbits or even humans. These creatures could spell the end for the Realm and all that inhabit it! Can your players defeat them - or at least safe some of the realm from them? Arrows & Bolts – Archers all around the realm are always looking for an edge against their adversaries. 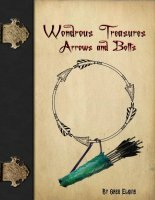 They are looking for magical weapons to help them in their adventures and arrows to help them as well. Arrows that slay lycanthropes, arrows that can turn creatures to stone, arrows that can cause blinding flashes of light. Adventurers want them and search dungeons – or even search through a dragon’s hoard - for them! More, more, more! Within these pages there are more spells, more magic items, more fantasy guidelines — everything you need to make a good Fantasy Hero 4th Edition campaign even better. 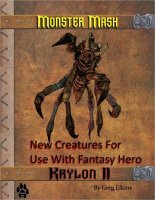 While not absolutely necessary to play, this book should prove a valuable play aid to all Fantasy Hero players and GMs. 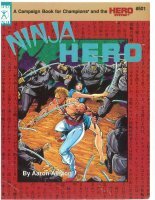 Fantasy Hero is a HERO System Campaign Book. That means that it provides all the information needed to play fantasy adventures using the HERO System rules. Within these pages you will find setting information, fantasy specifics, and a wealth of ready to use material. 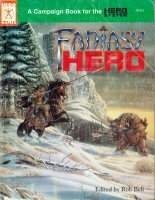 However, Fantasy Hero is not a stand-alone product; to use it the player must also have the HERO System Rulesbook (4th Edition), which contains all the rules for the HERO System. 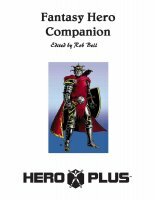 The HERO System Rulesbook can be purchased separately; it is also contained in Champions, the Super Roleplaying Game (4th Edition). 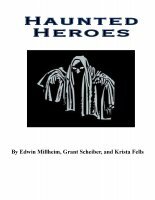 Haunted Heroes is set up with a multitude of short adventures, adventure seeds, characters and backgrounds, creatures, artifacts, items, and the horrific. All of these have one thing in common: the supernatural and the horrific. From spirits and mad scientists to creatures that hide in the dark recesses of the heroes. nightmares, all of these reside within these pages. Within, a game master will find dozens of things from the darkness to use as they are presented or incorporate into their own campaign. While we have tried our best to keep in good taste, there are certain things within these pages that could disturb some people. If you are weak of heart, easily shocked, or cannot grasp the difference between reality and a game world, go no further. This book is not for you!